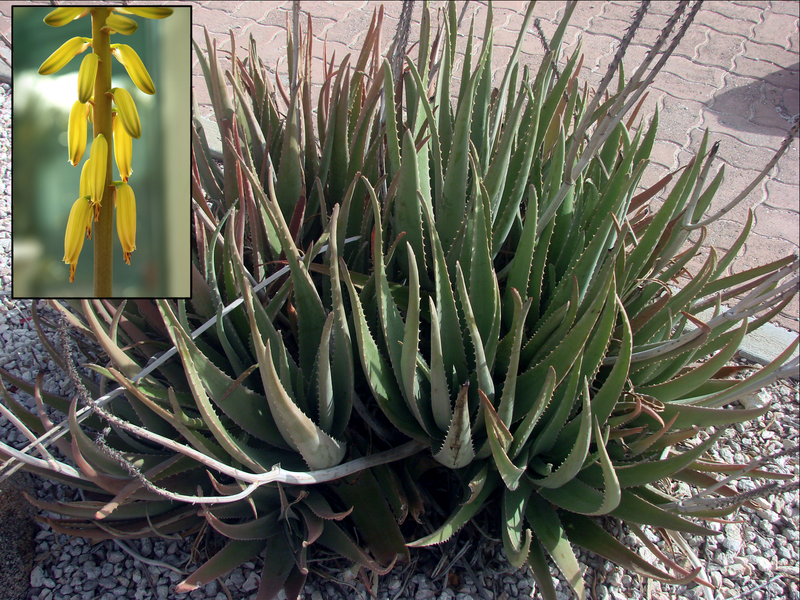 Dear Readers, this rather elegant but spindly plant is a member of the Aloe family, and has a bit of a history. The mother plant belonged to a good friend of my husband’s who died back in 1998, and this is a tiny offshoot from that original aloe. You might expect it to be a bit larger considering that that was over 20 years ago, but it has had an adventurous time of it. A few years ago I put it out in the garden so that it could have a summer holiday, but for some reason the local foxes took exception to it, and dragged it out of its pot and under the hedge. If my husband hadn’t noticed that it was missing, it would probably have died there, but as it was we were able to rescue it and repot it. I hoped that it would survive, and indeed it has, though I suspect it is still not as happy as it could be. 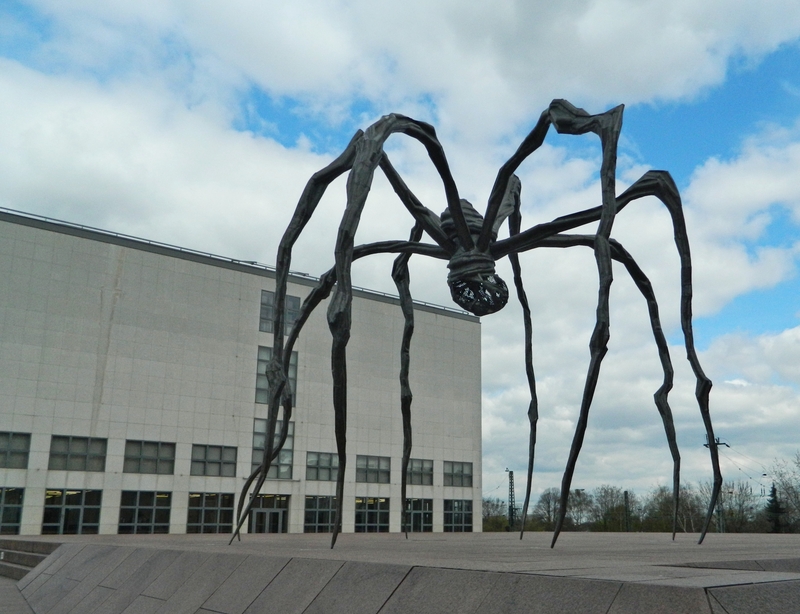 It reminds me rather of one of Louise Bourgeois’s spider sculptures. There are many, many species of Aloe, but knowing my husband’s friend, I think this plant is most likely to be Aloe vera, because he was very interested in the healing properties of plants. This plant originates in the Arabian peninsula, but has become naturalised in many parts of the world – indeed, I saw one on the island of Lanzarote that was easily the size of a small garden shed. 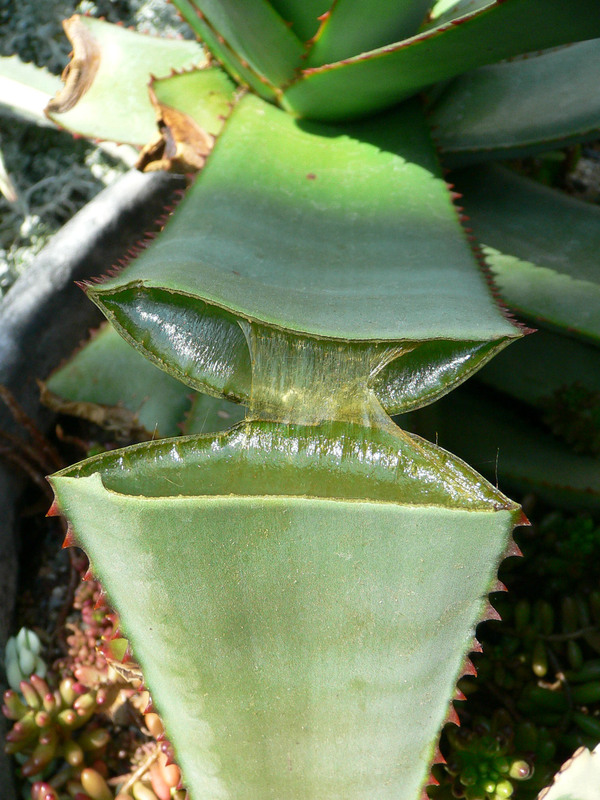 Like all aloes, Aloe vera is a succulent that is adapted for desert climates, and stores water in its leaves. The sharp spines along the edge of leaf are a protection against the grazing animals that would otherwise gobble it up in order to supplement their own liquid reserves. The water is held by the plant in the form of a gel, which is claimed to have all kinds of soothing and healing properties, particularly in cases of skin irritation or burns. The gel is also used as a dietary supplement and as a thickener for products such as yoghurt. Unprocessed aloe vera ‘juice’ contains a substance called aloin which can work as a laxative, although products marketed for this purpose were banned in the US in 2002 due to their potential toxicity. It has also been used as a cold and flu remedy, and to treat herpes. In fact, the ancient Egyptians knew it as ‘the plant of immortality’ and used it for more or less any ailment. Although sometimes considered effective against the side effects of radiotherapy treatment, Cancer Research UK has reviewed the evidence and remains unconvinced. 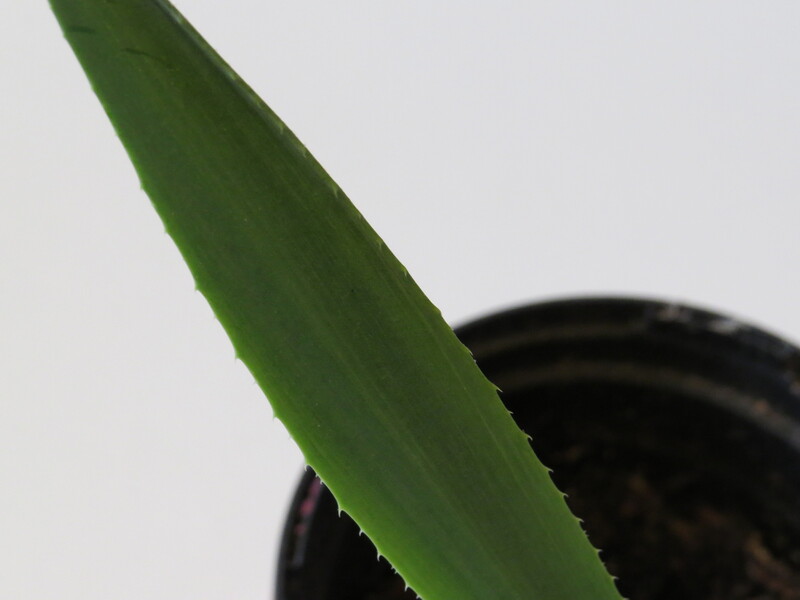 It is true, however, that Aloe vera has a history of medicinal use going back to the Egyptian Ebers Papyrus, a list of plants used in ancient Egypt from 1550 BC. I can see how temptingly emollient that sap looks, and am not surprised that among the products that I looked up at random are moisturisers, toilet tissue and, ahem, a colon cleanse. For a long time it was believed that Aloe vera grew only on the island of Socotra in the Indian Ocean, and Aristotle was said to have asked Alexander the Great to conquer the island to make sure that supplies of the plant could be maintained. Alexander is said to have ethnically cleansed the island of its original inhabitants, replacing them with Ionians who would tend the aloes. The island is also home to myrrh (a tree resin extracted from the bark of a number of small trees), which, with Aloe vera, was used as an embalming fluid. Although my Aloe vera plant is a bit weedy at the moment, they are rather splendid when they get to flowering size. 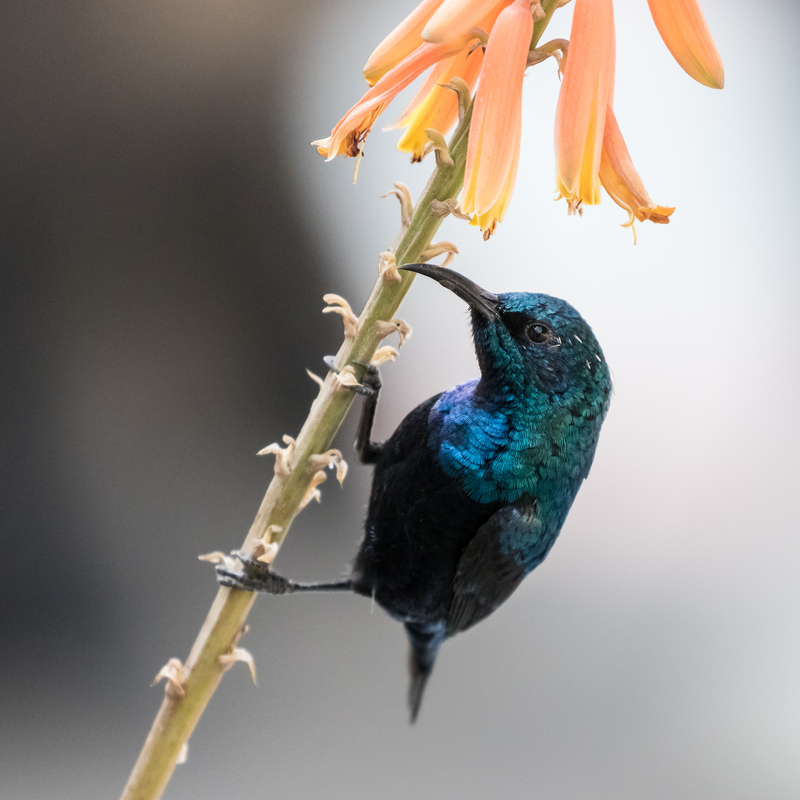 Although through some of their naturalised range Aloe vera plants might be pollinated by insects, they evolved to be pollinated by sunbirds, in particular the Arabian sunbird (Cinnyris habessinicus hellmayri). 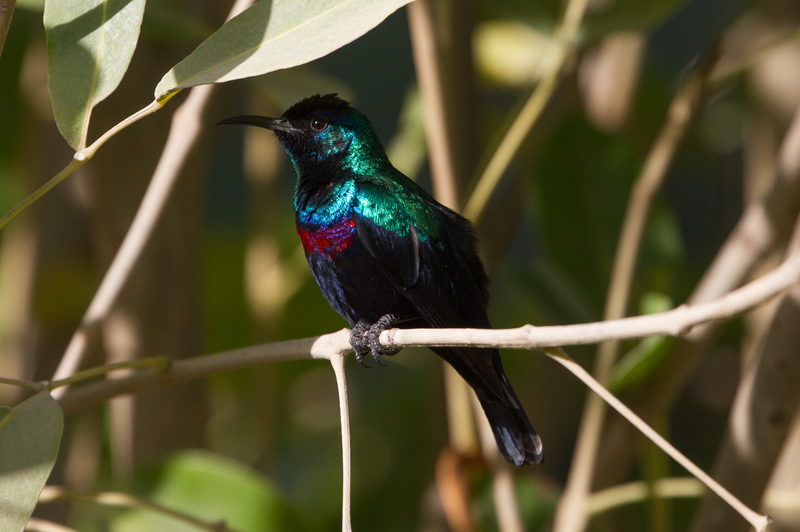 These fill the niche that is occupied by hummingbirds in the New World, and look surprisingly similar. 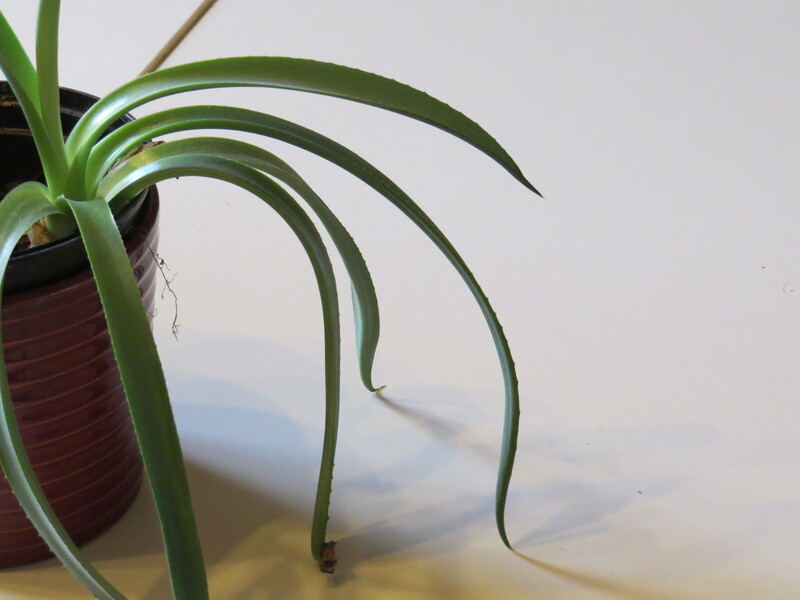 The plant can also reproduce by offshoots, like the one that produced my husband’s plant. And finally, a poem by Danielle Chapman, another poet who is new to me (and how I love the journeys that I go on when I research this blog)! She is based in Connecticut, but this poem speaks to me of somewhere else. I think she catches the way that curiosity, and close attention, is so often a cure for both major, and minor, pains. I have certainly found it to be so over this past few years. gel belling the top of that claw goblet. This entry was posted in London Plants on February 13, 2019 by Bug Woman. Thank you for another poetry find. I’m puzzled by line 12, though. Me too! I found myself squinting to picture some of the imagery, though I rather liked the poem as a whole. Someone else was just talking about Aloe vera. I had explained how so many different species are marketed as such, but the real Aloe vera is quite rare. Yours really looks like the real thing, but I really would not know, since I have not seen it in MANY years. However, the big shrubby one in ‘photo3’ is not Aloe vera. I do not know what it is, but it gets much bigger than Aloe vera. It is one of the two that I got my aloe extract from, just because we had a bit of it in the garden. I find that they are all somewhat effective. I do not know how much more effective Aloe vera is, just because I have never compared any of them. 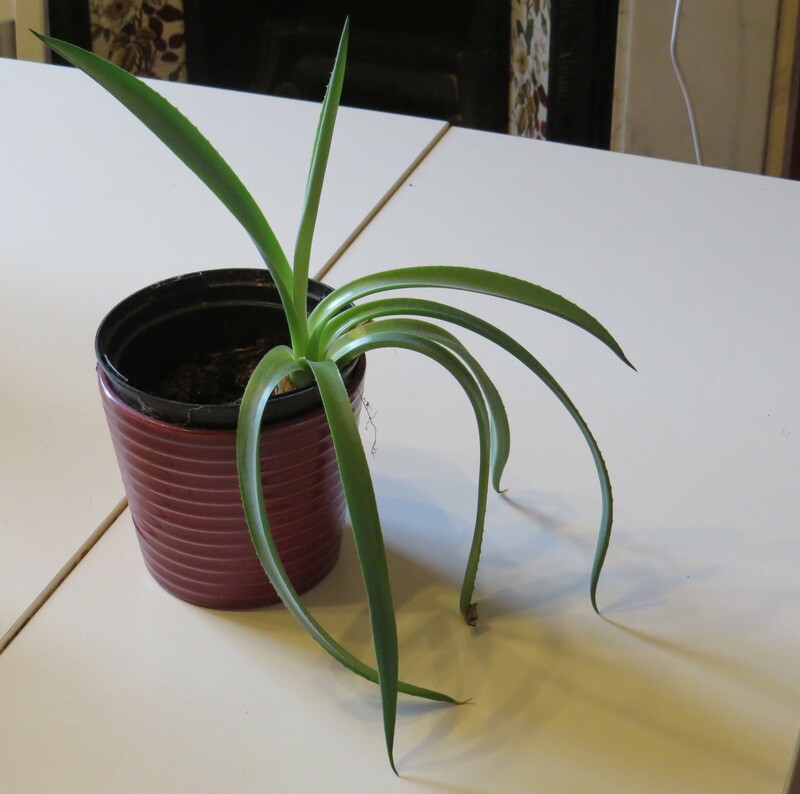 Thanks, Tony – you’re right, there seem to be a lot of plants on the internet that are labelled as Aloe vera, but they look so different that it’s difficult to decide what they are. Fortunately, they are all nice perennials. I happen to like my Aloe arborescens, even though it is not what I was expecting it to be. Your poor plant looks as though it needs a lot of sunshine; can you put it in a warm sunny spot in your home? I had one that lived in my bathroom for years and I found it useful for soothing small cuts and burns. I lost it after trying to separate some off-shoots for friends to propagate.